The DC metro housing market posted some highs that haven’t been seen in years, according to the analysis of June 2015 statistics by RealEstate Business Intelligence (RBI). Both buyers and sellers will benefit from these numbers, which indicate steady, positive growth in our market. What a great way to wrap up the spring selling season and head into summer and fall. Here are some “high”-lights below! * Sales volume across the region was nearly $3 billion, up 12.2% compared to June 2014. Closed sales increased 13% compared to last June, and it was the seventh consecutive month of year-over-year increases. For the fourth consecutive month, all market segments experienced growth in closed sales year-over-year — townhomes took the lead with a 15.2% increase, single-family detached were a close second with 15.1%, and condos were up 7%. Compared to last month (May) sales of single-family homes increased 21.9%, condos 12.3%, and townhomes 12.2%. With the highest June pending sales in more than 10 years at 5,755, new contracts exceeded both the 5-year average of 5,311 and the 10-year average of 4,780. The number of new contracts increased 11.6% from June of last year, making it the eighth consecutive month of increases year-over-year. Inventory exceeded the 5-year June average of 11,520 hitting 12,324 this month. However, it was still below the 10-year average of 16,401. Condo inventory continued to grow with a 19% increase, townhomes with a 11.4% increase, and single-family detached homes at 11.5% New listings of single-detached family homes increased the most at 8.2%, followed by condos with 5.6%, and last with townhomes at 3.7%. Days on Market had a slight increase from the previous month but still remains low, with townhomes selling in 11 days on average, detached homes with 15 on average, and then condos with median of 18 days. The majority of homes in all jurisdictions continue to sell in less than three weeks. Prices — Median Sales Prices Near Record Highs and Continue to Rise Steadily Over Last 12 Months. The June median sales price of $439,000 increased $6,000 or 1.4% gain over June 2014, and a $4,000 or 0.9% increase over last month. Prices have appreciated more than 25% since bottoming out 5 years ago in the first half of 201o. Single-family detached prices held steady at $550,000 while townhome median sales prices were up by 1.9% to $415,000. Condo prices increased 4.2% to $312,500 in June. 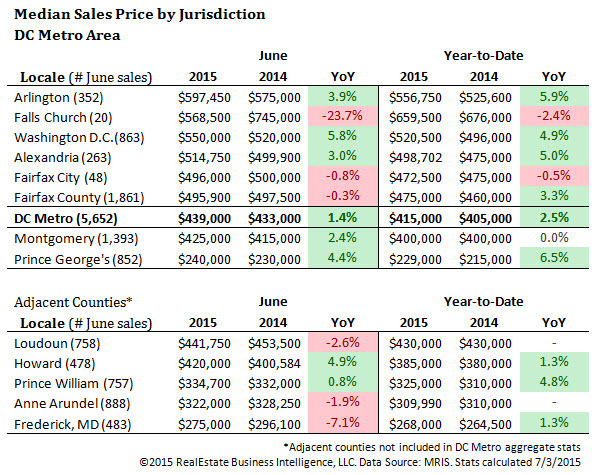 Arlington County showed the highest June median sales price in the region, with a 3.9% median sales price increase to $597,450, a 24.4% hike from last June. The District had a 5.8% increase in median sales price to $550,000, a 2.9% bump from last year. Alexandria City increased by $14,850 to $514,750 this June. Median sales prices in both Montgomery County and Prince George’s County increased by $10,000, with prices in Montgomery rising to $425,000 and prices in Prince George’s increasing to $240,000.